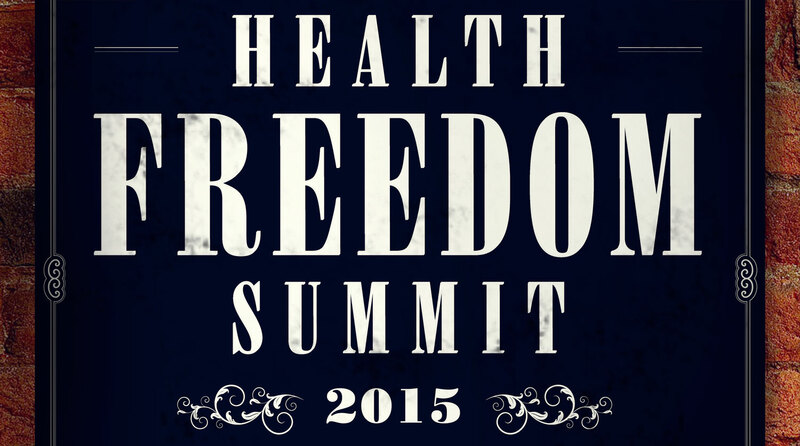 Here is the schedule for the Food & Thought Health Freedom Summit-2015. Times and speakers are subject to change. This article from Natural Awakenings magazine and another from Review.org gives a short bio for each speaker, and a brief description of what they will be covering in their talks. *Schedule is subject to change. Check this page regularly for the most up-to-date information. hi, WHERE is this being held please? Hi Val! I believe Mike is still negotiating the locations and all of that. But it seems that we will be hosting much of the event at Naples High. Will the food and thought restaurant and cafe be open for this event? We are happy to say yes we will be open every day of the event, including Sunday. We also will have vendors in our courtyard selling all sorts of healthy goods. What is the cost of the whole weekend and do we need to purchase tickets in advance? The whole event is free, but there are a few speakers where we’ll be giving tickets out for seats on a first come, first served basis. Hello, I’m very excited about this summit and to see some of my favorite Health advocates, but I’m new in the area (Ft. Myers) and have no idea where the high school is…could I call Food and Thought for more details? Hi Jennifer. Welcome to Southwest Florida! The high school is right behind Food & Thought, so if you know where our store is, you shouldn’t have much trouble finding Naples High School. If you have any questions, feel free to call. A quick Google search should point you in the right direction as well. and where will she be speaking? At the NHS? Vaishali is so far still scheduled to be speaking at Naples High School on Sunday, 2/22 at 4:30 p.m.
Hello and Thank You for this event! I work weekends only, and was wondering if there will be anyone taping the events and sharing them on youtube? I am a 21 year cancer survivor with only naturopathic treatment and healthy lifestyle! 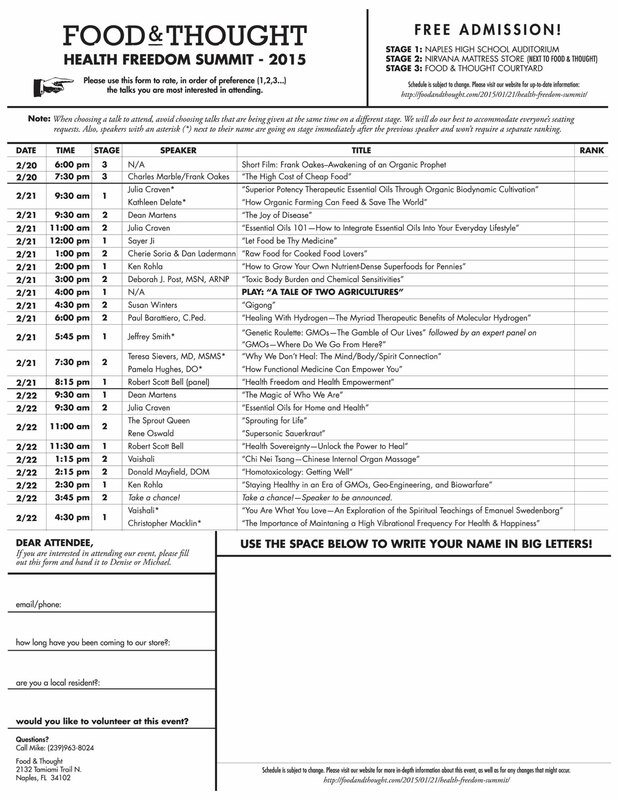 Would really like to view some of these amazing free info stage presentations. Keep me posted.. Thanks! We are so excited to see the whole program, but especially looking forward to the film about Frank. We miss Frank and his catchy phrase – “everything is going to be alright”. Hi can you tell me where on Saturday Susan Winters will be speaking on Qigong? And Vaishali on Sunday? Thank you for your interest, and way to go on your battle against cancer! We are very happy to hear about your progress. We will be posting these talks to YouTube (or Vimeo) and linking them on this site and our Facebook. We’re sorry you won’t be able to make it for the event, but hopefully you’ll get to enjoy the talks soon. On Saturday Susan Winters will be giving her talk from the second stage at the Nirvana Mattress store (in the same parking lot as Food & Thought). On Sunday Vaishali will be giving talks on both stages at different times. Her first talk will be on the second stage (Nirvana Mattress) and her last talk will be on the main stage at Naples High School Auditorium. Great event with lots of information public should know about.! It is a shame not as many people showed up to take advantage of it. Thank you Food for Thoughts for this informative event! I am wondering if this is an annual event, what date would be going forward in 2016. I loved the 2 talks I attended…especialy loved Cherie Soria’s raw food demo; she’s remarkable! And it drew a big crowd, I thought.